New Orleans has quite the reputation when it comes to scary stories and unnatural hauntings. 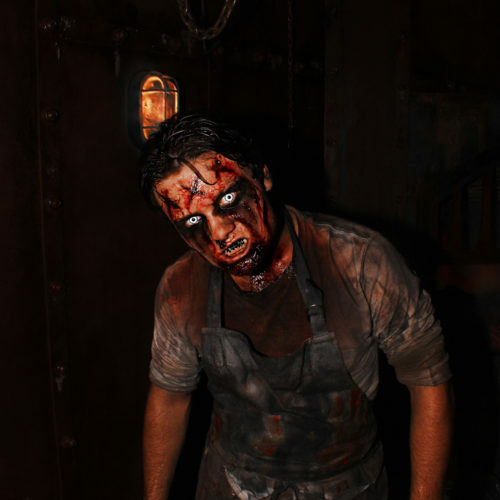 So, it makes sense that it would also be home to one of the country’s most highly regarded haunted house attractions, House of Shock, which will be rounding out its 25th season this week. I recently sat down with one of the house’s founders, Ross Karpelman, to hear his thoughts on the attraction’s creation, how far it’s come, and what visitors can expect this year. Q: So how does one start a haunted house? Ross Karpelman: (Laughing) it was a long time ago. I was 23, and we were all kind of just huddled around— myself and my friends— and we were just talking about Halloween and how much we loved horror and music related to horror. And how we had all done our own haunted houses as kids and we just didn’t know what to do for Halloween anymore. It’s like you’re 23 years old; you’re a little old to go trick-or-treating. You don’t want to go to the bar (because you go there every other night). So, we just decided to throw our own haunted house and kind of relive our younger years. So, we built a haunted house in our backyard— [me and] Jay, who’s still my partner today— and we just went from there. We focused on performance, you know? Our sets weren’t much to look at in the backyard days; it was just black plastic sheet plastic sheeting on two-by-fours and whatnot. But our performance was dead-on because we’re very performance minded, so we had people convinced that we were the real thing. And that caught wind pretty quickly. After two years in our backyard, we decided to go legit and get a building and go from there. RK: I do. I’m in the haunted house as a character actor. I play music and [have] done all kinds of stuff. I’m pretty well versed in that area. Q: How do you get into character for something like that? RK: Once the makeup goes on you’re in a different state of mind. You put the costume on and automatically you just have this bravado about you. You become someone else. It seems silly to think that you can acquire another personality just by donning a costume, but for me that’s the way it works when I’m in character. And I don’t break character. Well, unless I’m behind the scenes. I’m not like [a] Daniel Day-Lewis kind of guy that goes home and acts evil. So you don the personality and you assume the personality and whenever you’re in front of patrons or people from the outside you channel it and you just go with it. Q: Besides the haunted house what other attractions you offer? RK: Well, we have the haunted house itself and there are three sections to the house— three events. Our brand new event this year is “Conti’s House of Wax” which we based off of the Musee Conti Wax Museum that was in the French Quarter for fifty-something years. We all went there on a field trip back in the third grade, and I remember being completely creeped out. And then you go into the chamber of horrors area where they had Frankenstein [and] the Phantom of the Opera and I was terrified. And that stuck with me. We heard that they were closing about two years ago, and we went to the final thing and it just brought us right back to when we went there as kids. So we decided to pay homage to [this] New Orleans institution. 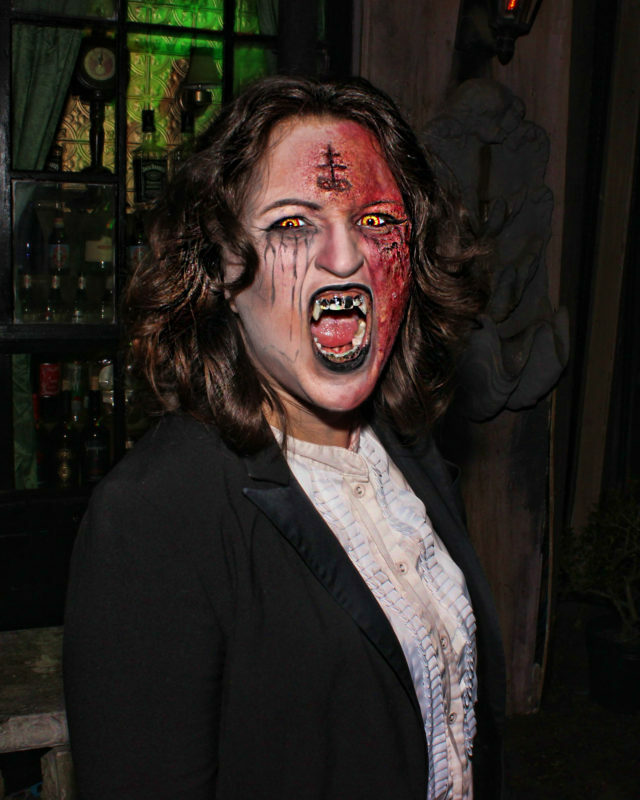 In the wax museum we highlight different parts of New Orleans and Louisiana macabre history. So we depict the LaLaurie Mansion, the Myrtles Plantation— which is one of the most haunted homes in the States. We also do fables like the Rougarou or the Honey Island Swamp Monster which are our versions of either Big Foot or a werewolf. And then we also pay tribute to Morgus the Magnificent, who was a big part of New Orleans early TV. We actually owe him and Dr. John for the name House of Shock. If you listen to Dr. John’s song that he wrote about Morgus, he talks about, ‘…you get your kicks at the house shock,’ and that’s where that came from. So we’re paying homage to all the things that make New Orleans the city that it is. For everything that is pleasurable, [the city’s] also got that dark side that people find intriguing. So, after you go through the wax museum you go through an amazing 3-D event. You put on 3-D glasses. It’s all painted fluorescent colors and the walls come to life. And then we have people in there as well that are behind every turn. And it’s truly— and I’m not just saying this because it’s mine— the best 3-D event I’ve ever seen. And then after that, you think, ‘Oh, I’m done!’ No. Then we transfer you into the actual haunted house–the House of Shock–and you enter in through another [New Orleans] homage: the LeBeau Plantation, the old mansion in Arabi that burned down two or three years ago. Then outside there is an entire festival. 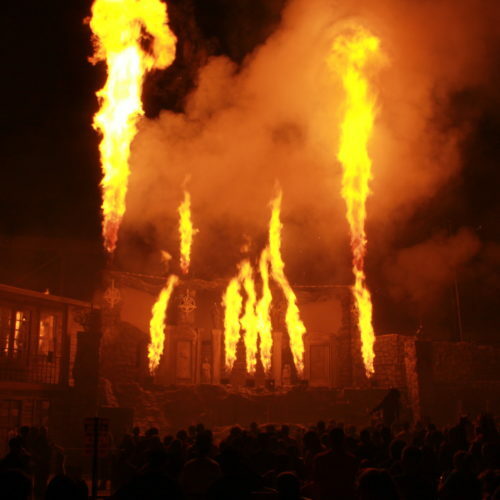 We have bands every night, sideshow acts we bring in, and then we have our stage show itself which is an amazing production with pyrotechnics and stunts. Q: And you also have 350 volunteers working every night? RK: Yeah! And we wouldn’t be anything without these guys. They give their heart and soul and blood and sweat and tears to this place. Many of them have been with us for at least 20 years. They met someone and they got married at the haunted house. It’s its own society really. It’s like a microcosm of the world at large. Without our volunteers, our cast of dedicated people that have been through thick and thin with us, we wouldn’t be nearly the production that we are. Q: When you started this 25 years ago. That’s a long time. Were you thinking anything like this that you’d still be doing this? RK: No, certainly not to this extent. It was a party for us. And it still a party for us and we do it for ourselves because we enjoy it. The fact that everybody comes and see it is the payoff— to see the looks of disgust and then the screams and the scares and all that stuff is definitely the payoff. The only thing that really kind of spurred us on and why we felt like we had to go on was when the city council said that we couldn’t [do it] because they didn’t agree with the message that we were sending. That evil had descended and all that kind of stuff. Were totally cool with the councilman now; he calls us to do special events for him and we have very great voices with them now. But back in the old days, they were listening to their constituents and the rumor that evil had moved into Jefferson Parish. They were going to do everything in their power to get rid of it. Well, of course, you tell a 25-year old that you can’t do something and they’ll find a way to prove you wrong. The art of rebellion is what spurred us on. So, it became a social issue. And that made the front page of the paper and we’re talking about it on [the] radio. We had hired an attorney to speak on our behalf. There was a classic tape out there of our attorney battling the councilman on talk radio and he was just completely thrown. But I think that’s why we felt like we had to go on. And it just snowballed from there. Q: What scares you? Have any of your fears been quelled since you started House of Shock? RK: Gore doesn’t bother me. You know, monsters don’t really bother me. Aliens have me feeling a little, you know— curious? Ghosts and ghost movies have always been the ones that always got me. Or things that revolve around mental illness or a more complicated storyline—something that you can’t handle or can’t control. Movies like The Exorcist which brought in that whole possession element which was way before its time. Q: Before we get going I wanted to hear a little bit more about you. On top of HOS, you are also a musician? RK: Yeah, I’ve dabbled. I work in the music industry as well. I started out as a musician. I’ve played in a number of bands and played on a number of projects in the New Orleans heavy metal community. Also, I’ve tour managed a bunch of bands. And you know babysitting a bunch of 20-something year olds and then 30 and 40-something year olds as well down the line kind of got old. So, now I’m a bus driver. I drive the buses for bands and acts all over the country and Canada. Just tell me where to go and I’ll bring you there. That’s kind of where I’m at in my life. So yeah, I’m working for a number of bands. I was just out with Guns N’ Roses this year and I did a tour with Black Sabbath. It’s cool. I enjoy the job because I always love to drive long distances anyway so it fits right in. Q: And that’s a good way to see the country, huh? The House of Shock is located on 319 Butterworth Street in Jefferson, Louisiana. 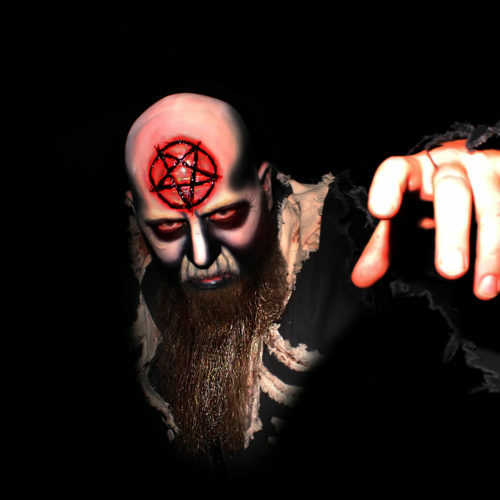 You can find out more information about the haunted house and their other features at www.houseofshock.com.